A true taste of Michigan! 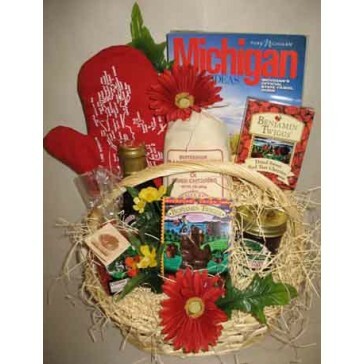 Dried cherries, chocolate-enrobed cherries, cherry syrup, pancakes, cherry jam, cherry candy, Michigan oven mitt and magazine. Enhanced with seasonal flowers for bright presentation.